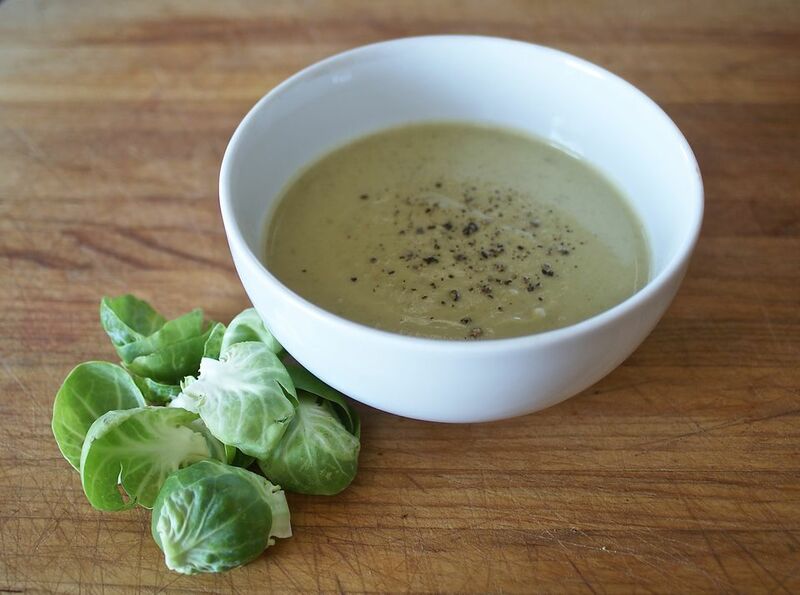 Much like its cruciferous cousin, cauliflower, Brussels sprouts turn into a wonderfully rich and creamy soup just by cooking this vegetable with aromatics and whirling it up in broth. This soup ends up having a much deeper nutty flavor than you might expect, as well as a thicker, more satisfying texture than you would imagine that these tiny cabbages could possibly contain. You can add a bit of cream for an even creamier effect, but it is not necessary since this soup holds up on its own without the added cream. This Brussels sprouts recipe is a lovely first course to a fancy dinner, meanwhile, serves as a satisfying base for a vegetarian dinner with a green salad and some hearty whole grain bread for a complete meal. Like most soups, this one doubles or even triples with ease. Feel free to make a big batch and freeze some for later (just be sure to pop it in the freezer before adding the cream, which does not handle being frozen and reheated as well as the rest of the soup does). Trim off and discard the stem ends of the Brussels sprouts. Roughly chop the sprouts, if they are big. The Brussels sprouts will get puréed in the end, so while even pieces will cook more evenly, this is not a beauty contest. No matter how you have prepped them set them aside. Trim and roughly chop the celery; peel and roughly chop the shallot or leek. Heat the butter in a small pot over medium-high heat. Once it is melted, add the celery and the shallot. Sprinkle with the salt and cook, stirring frequently, until the vegetables are soft, about 3 minutes. Add the chopped Brussels sprouts and stir to combine. Cook, stirring occasionally until the Brussels sprouts turn a brighter shade of green, about 2 minutes. Add the broth and bring everything just to a boil. Reduce the heat to maintain a steady simmer, cover partially, and cook until the Brussels sprouts are completely tender about 10 minutes. Use a hand-held immersion blender to completely purée the soup. (You can also do this in a blender, but just be sure to let the soup cool a bit first, work in batches, and put a kitchen towel over the top of the blender in case the heat of the soup makes it splatter out.) Be sure to purée the soup a bit longer than you may think is necessary; you want the final product to be as smooth as possible. Stir in cream, if you like. Serve the soup hot, with a garnish of freshly ground black pepper to taste. Keep it chunky: Slice or chop the Brussels sprouts evenly and then omit the step of puréeing the soup. Make it heartier: Add a peeled and chopped potato to the mix, cooking it with the Brussels sprouts, for a thicker, heartier soup. Add garnishes: There are endless possibilities to finish the soup—from freshly chopped herbs to crumbled cooked bacon to a few gratings of Parmesan cheese.